Its model number and name are #006 / Hired Henchman. 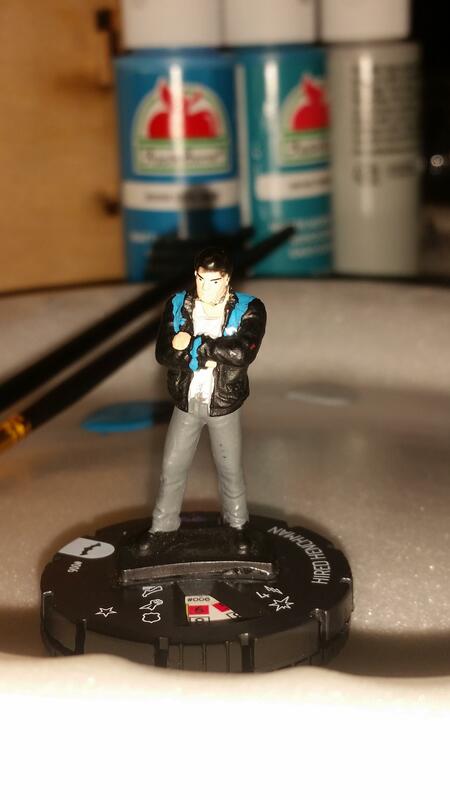 Character Bio - Peter Stanchek is one of only three psiots alive born with their powers activated, with powers rivaling that of Harbinger Foundation leader Toyo Harada. Having his abilities active early on lead him to a lifetime of homelessness, drug use, and misdiagnosed mental illness. Eventually, he was recruited by Harada to the Harbinger Foundation, where his ability to “activate” latent abilities in others was put to use. After losing his best friend and realizing the moral corruption of Harada, he lashed out and formed a group of Psiots all activated by him called the Renegades. From the first Harbinger War and beyond, Peter leads the Renegades with one goal in mind: bring Harada’s empire toppling down around him. Last edited by LordVenoc; February 9th, 2019 at 04:20 PM. 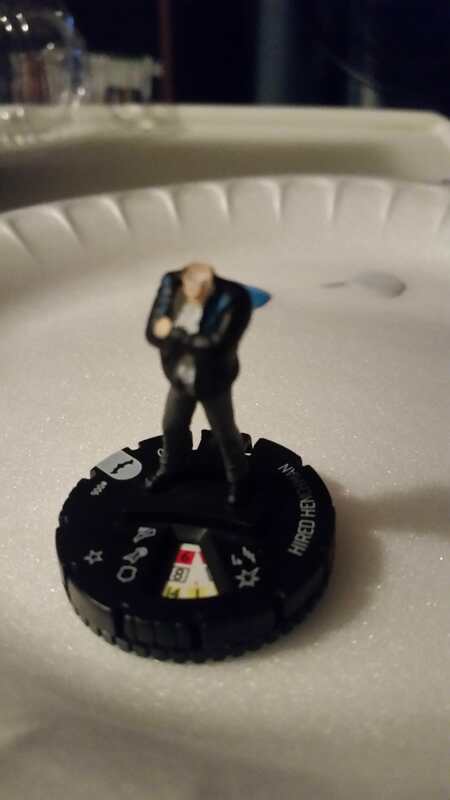 After revealing an Order Marker on this card and taking a turn with Peter Stanchek, you may choose any Unique Hero within 3 clear sight spaces of Peter and roll the 20-sided die. Add 5 to your roll if the chosen Hero is a friendly Psiot. If you roll 15 or higher, take temporary control of that Hero and immediately take a turn with the chosen Hero. At the end of that turn, control of the chosen Hero returns to the player who controlled the Hero before the Telepathic Command. All Order Markers that were on the chosen Hero's card will stay on the card. You may not take any additional turns after using Telepathic Command. Choose up to 3 figures within three spaces of Peter to be affected by this special attack. 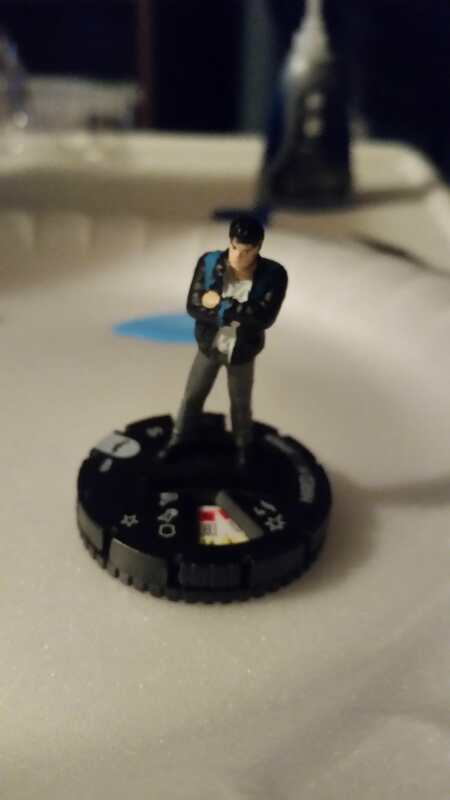 Roll attack dice once for all affected figures. For each blank rolled, choose one of the affected figures to be Stung for the remainder of this round. Stung figures may not move or attack. Peter may only use this special attack once per round. If Peter or any friendly figure within 3 spaces of Peter is attacked and at least 1 skull is rolled, you may reveal an "X" Order Marker on this card. If you do, ignore that attack and the defending figure may not be attacked for the remainder of the attacking player's turn. 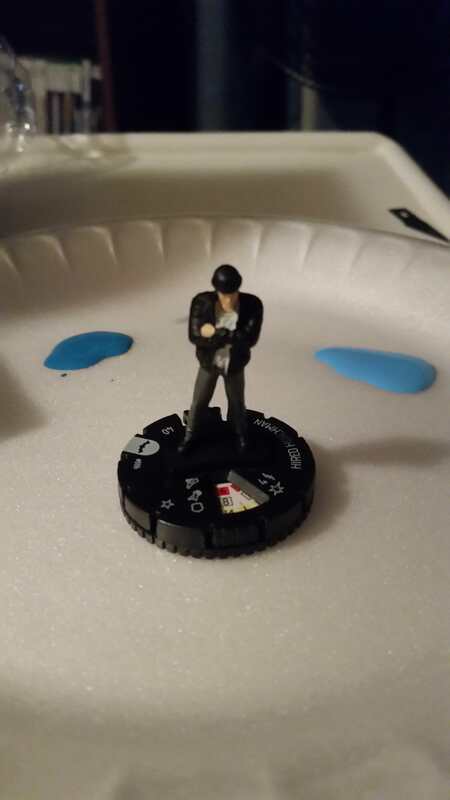 You will need the Hired Henchman mini and a black-haired mini of your choice. I used Clark Kent 009 Man of Steel. You will need a dark teal shade of paint. It may be beneficial to have black paint and peach (skin-colored) paint to clean up any defects that may come up in the process. Photos are in spoilers. 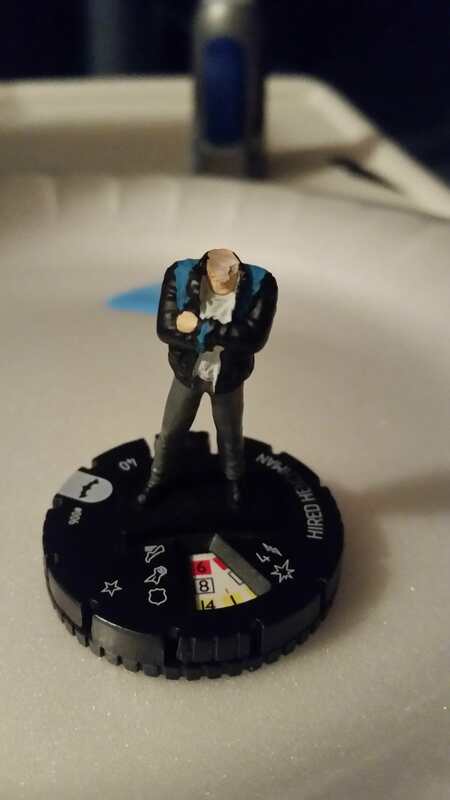 First take your Hired Henchman mini. Next, remove the Thug's head. You'll have to make a bit of an angled cut to keep the collar of the jacket mostly intact. Next, take your teal colored paint and add color to the upper torso sections on each side of the jacket. Use the same color as above to paint the upper back of the jacket. Carry this color over to the wrists of the jacket, making a thin line near the cuffs. Next, use your chosen black-haired mini. Most straight-haired styles will work fine. Remove the figure's head, matching the type of cut done to remove the initial head. 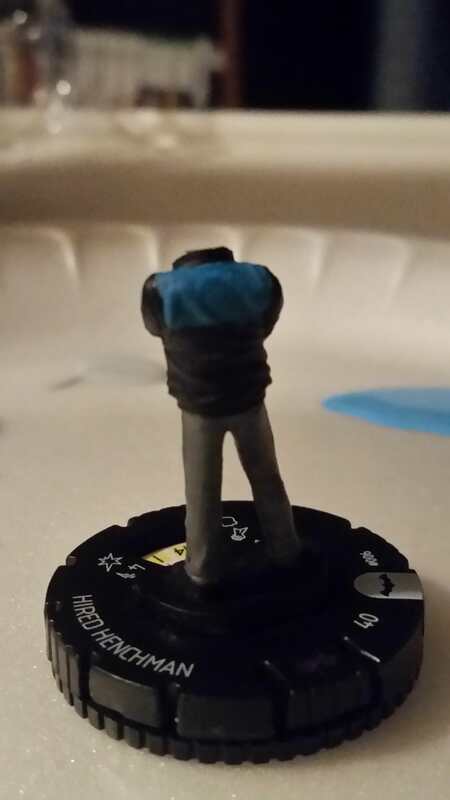 Attach the head to the base Hired Henchman figure. Clean up any paint issues you may have, touch up the paint on the neck if necessary, then you have your finished product. Last edited by LordVenoc; January 31st, 2019 at 09:29 PM. Was there a decision made on calling him Sting vs Peter Stanchek? Peter Stanchek is live. There's still some things to be nailed down design wise to get him fitting the character appropriately but also keeping him at an appropriate power level. Also, finishing a reread to see if the Sting name was ever actually used in the era this design is based on. I saw it in some of the stuff when I was reviewing for the design, but that kind of blurred eras at times, and I don't remember it being used as his codename. An attack he could do was called the Sting, but I don't remember it in the name. Minor detail. That last power already exist. 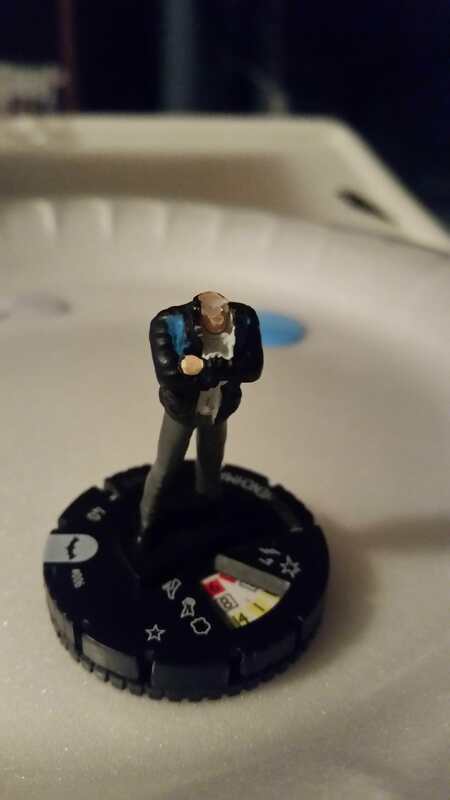 Once per round, if Professor X or any friendly figure within 3 spaces of Professor X is attacked by a figure that does not have the Mental Shield special power, and at least 1 skull is rolled, you may reveal an "X" Order Marker on this card. If you do, the attacking player's turn immediately ends and the attacked figure receives no wounds. The second Power is the "holy crap" power for me. Attack of 4 on -1 defense is going to hit pretty often. The ability to neuter an opponent for the GAME is pretty significant even on a 20. Things like that usually drive a price up due to fear. Combining that with Psychic Defense X is a REALLY strong figure. That's not even looking at the first power. I would summon the CRB sooner than later. That looks like a lot of text. Do you think making it an instead of attacking autowound power would help? He's used it to lobotomize enough that I'd kind of like to keep the neutering, at least once per game. But don't necessarily like more markers. I didn't intend for the Shield ability to be a pure replication of Psychic Defense as that ends turns but I intended for this to be a one attack block. Is the difference not coming through, or do we feel the difference isn't substantial enough to merit a new power? Yeah. Its a lot of words. That's why I lean toward the alternate power right now, purely because I know that it is one that can be pared down in word count with a little effort. I'm definitely cool with the nerfed Psychic Defense X - I picked up on that, and not ending the opponent's entire turn is a huge difference that makes it way less scary. I'd make a decision here sooner rather than later. Will help to mitigate confusion. Wow, impressive stat block. 8 Move is threatening, especially with 6 range and solid Attack/Defense. He's Star-Lord and Captain America compatible, which means he could effectively run at 8/6/7/8. Before moving, you may choose a Unique Hero figure within 3 clear sight spaces of Sting that does not have the Mental Shield special power. Roll the 20-sided die. If you roll 15 or higher, take control of the chosen figure and that figure's Army Card and remove any Order Markers on that Army Card. If a Hero affected by this special power is no longer within 5 clear sight spaces of Sting at the start of any player's turn, remove any Order Markers on that figure's Army Card and return control of the figure and that figure's Army Card to the player who controlled the figure before it became Telepathic Controlled. This definitely needs a limit of one unit at a time. If that is not the case thematically, there needs to be some other limiter. Before moving is a big limiter in itself, but you could snag most Unique Heroes in the game on a 30% chance. Taking your opponent's key figure or strongest figure won't be all that difficult with 8 move and flying. Sting does require clear line of sign when attacking with Mental Scream Special Attack. Figures attacked by Mental Scream Special Attack roll 1 fewer defense die. If an opponent’s Unique Hero receives at least one wound from this attack, you may roll the 20-sided die, adding 1 to the roll for each wound the figure received. If you roll a 20 or higher, that figure may not use any special powers on its card for the remainder of the game. This is really interesting! I'm more okay than others with the permanent negation, but to heed their feedback, you could remove the modifier from the roll and/or allow those figures to regain their powers upon Stanchek's demise. Once per round, if Sting or any friendly figure within 3 spaces of Sting is attacked and at least 1 skull is rolled, you may reveal an "X" Order Marker on this card. If you do, the attacking player's attack immediately ends and the attacked figure receives no wounds. As YK said, this is a pre-existing power from Professor X, so it's a simple wording and name change once the breathing period is up. At the start of the game, you must choose a Unique Hero you control and place a Blue Bond marker on its card. That figure is considered Bonded to Peter. When the Bonded figure would receive enough wounds to be destroyed, immediately place the Bond marker on the card of an opponent’s figure in 3 clear sight spaces of the Bonded figure. While the Bond marker is on the card of a figure you control, Peter may add 2 to his move if he ends his move within 3 clear sight spaces of the Bonded figure. 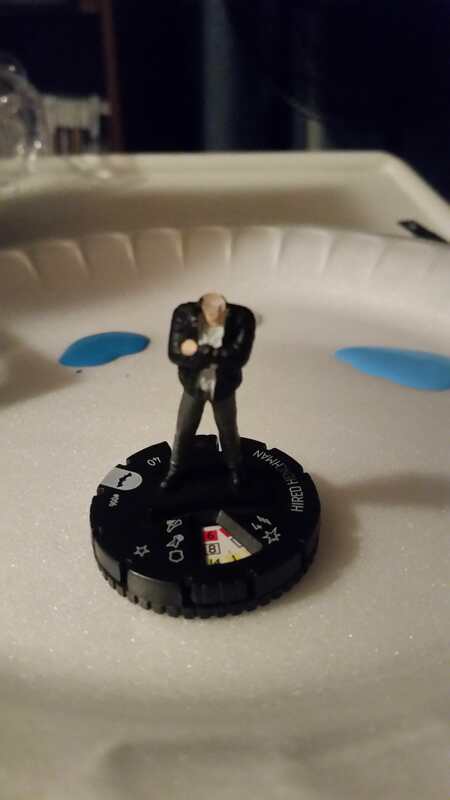 If the Bond marker not on a figure’s card you control, Peter adds 1 to his attack and subtracts one from his defense. 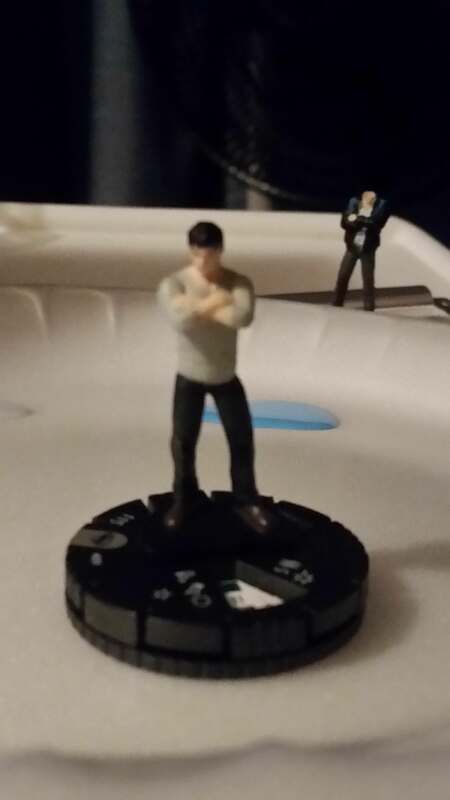 When Peter attacks an opponent’s figure with a Bond marker on his card, he may attack that figure one additional time. I'm less excited about this direction than the current first power, but it is an avenue to be explored if there is enough backing. Whatever the case, great start, LordVenoc! You're breaking ground here with a new comic universe, one that supposedly is pretty popular. Definitely tag in the CRB as soon as possible, I think they will have good insight. A point range would be helpful. Currently looking like mid 300s. Though that 4 Life helps quite a bit. Is he basically normal Human endurance?